The following weekend events have been organised to commemorate the 100th anniversary of the end of the First World War. 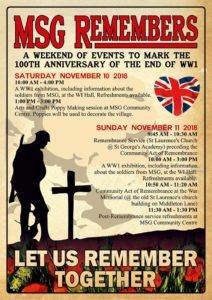 10 a.m. to 4 p.m.. A WI exhibition including information about the soldiers from MSG. In the WI Hall. Refreshments available. 1 p.m. to 3 p.m. Arts and crafts poppy making session at the MSG Community Centre. Poppies will be used to decorate the village. 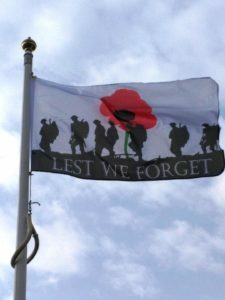 9.45 a.m. to 10.30 a.m. Remembrance Service St. Laurence’s Church at St. George’s CE Academy preceding the community act of remembrance. 10 a.m. to 3 p.m. A WI exhibition including information about the soldiers from MSG. In the WI Hall. Refreshments available. 10.50 a.m. to 11.20 a.m. Community Act of Remembrance at the War Memorial at the old St. Laurence’s Church building on Middleton Lane. 11.30 a.m. to 1.30 p.m. Post Remembrance Service Refreshments at the MSG Community Centre.